1. Crust - The earth's surface is the crust which is up to 40 miles deep. The earth's crust makes up the continents and ocean floors. 2. Mantle - The layer beneath the crust is the mantle which is approximately 1,800 miles deep. The mantle is made up of magma (or lava) and rock. When you see a volcano erupt the lava from the volcano has magma in it. 3. Outer Core - The third layer is called the outer core which is made up of iron and magma. 4. 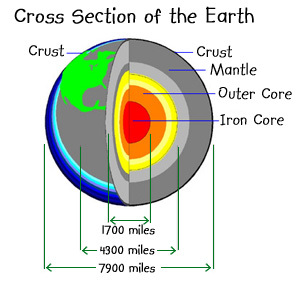 Iron Core - This is the center of the earth which is made up of iron. The word geothermal comes from the Greek word geo - meaning earth - and therme - meaning heat. Geothermal energy was first used by ancient people for heating water for bathing. There are many natural hot springs around the world that are heated by the earth and used for bathing. 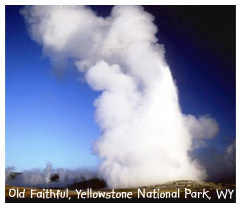 Perhaps the most famous form of geothermal activity is the geyser "Old Faithful" in Yellowstone National Park, Wyoming. Natural geysers form when underground chambers fill with water and are heated by the earth. Steam is created when the water is heated to its boiling point. The pressure from the steam causes the geyser to erupt, spewing its contents, and the cycle starts all over again. Geothermal energy is also a renewable energy source. The earth continuously produces rain for water and magma for producing heat. Deep inside the earth the water and rocks absorb the heat from the magma and we can dig wells and pump out the heated water or steam. This heated water can be used for heating and generating electricity.